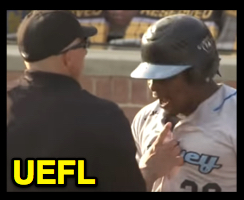 Benches cleared after a 9th inning go-ahead home run by Sydney Blue Sox batter Gift Ngoepe, who yelled at Sydney Bandits pitcher Loek Van Mil, who responded with a lewd gesture similar to that which Joe West ejected Jonathan Papelbon for in Philadelphia during the 2014 MLB season. With two out and none on—Van Mil having already surrendered a game-tying home run to Sydney's Dwayne Kemp—Ngoepe hit a home run to left field. While rounding second base, Ngoepe appeared to repeatedly look toward the pitcher's mound before yelling in that direction as he rounded third base. In turn, Van Mil made a lewd gesture that somewhat resembled the crotch-grabbing maneuver ex-Phillies pitcher Jonathan Papelbon made toward the fans of Philadelphia as he exited a game in September 2014, leading to an ejection care of Crew Chief Joe West. Related Post: MLB Ejection 189: Joe West (3; Jonathan Papelbon) (9/14/14). No one was ejected this time around in Brisbane, as HP Umpire Paul Latta and crew herded the Blue Sox and Bandits back toward their respective dugouts.